Racers love to strut their stuff at the biggest circuits and in front of the biggest crowds, so it was no surprise to find the Eclipse Motorsport Mosler MT900R on the entry list for the TAG Heuer 250, a 2 x 45 minute event supporting the inaugural A1GP meeting. A big crowd was assured and on Sunday, the Eclipse boys would be performing in front of one of their biggest ever audiences. Phil Keen and Steve Hyde would be performing the driving duties, as normal. 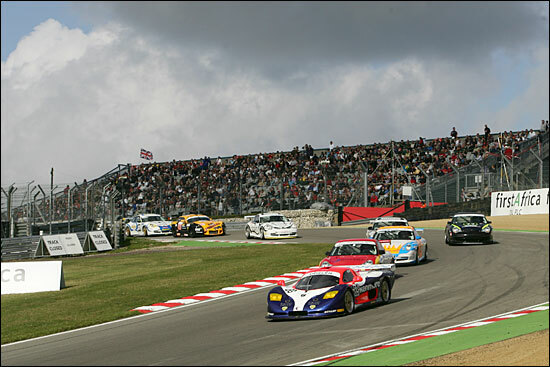 On the Saturday though, still in front of an audience that would not disgrace a normal British GT raceday, there was the first 45 minute race. The Cadena GTC Racing Mosler started the race from pole, Barrie Whight alongside Eclipse’s Steve Hyde on the grid, with the quick Redline Porsche just behind, Ian Khan eager to try and take Mosler scalps. Whight made a storming start and Hyde tucked in behind. But Ian Khan had made a great start, the Porsche 911GT3-RS also quick out of Druids and up the inside, alongside the Mosler out of Graham Hill Bend: the final flourish to a beautifully executed move was to keep the inside line into Surtees. Steve Hyde would have to fight hard to regain his second spot. By Lap 7 though a brave defence from Khan was over, the Porsche pulling neatly onto the Indy circuit, the gearbox broken. But Steve Hyde had been bottled up for the first 12 minutes of the race and Whight had taken full advantage. 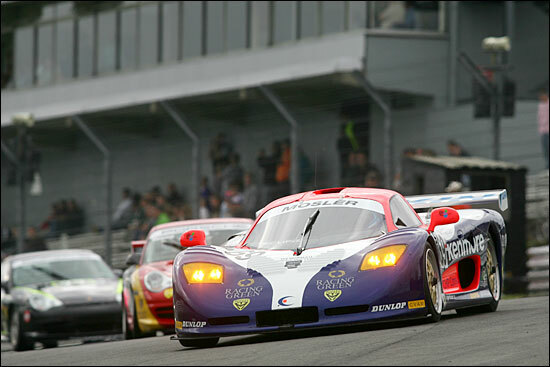 At the 15 minute mark Whight held a 6.2 second advantage over the more distinctively liveried Mosler, with Ricky Cole closing fast on the Eclipse man in the Xero Corvette, now just 1.3 seconds behind - and ex-Eclipse man Richard Stanton now up into fourth 5.6 seconds behind in the Peninsula TVR. 15 minutes elapsed and Steve Hyde pitted at the first available opportunity, allowing Phil Keen to take up the chase. His response was immediate, setting two consecutive fastest race laps. 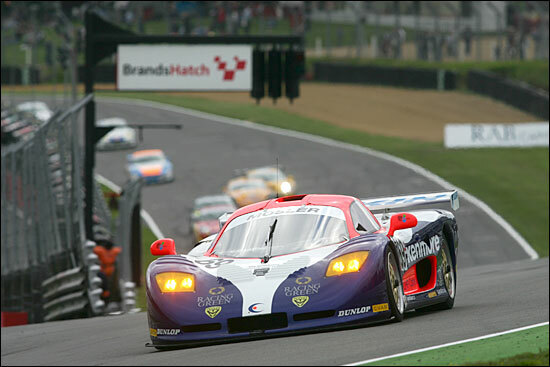 Cadena though were on top of their game: Whight got the message immediately that Phil Keen had emerged in the #69 car and Gavan Kershaw made ready to climb aboard the leading Mosler. The Cadena man soon showed his spurs, himself setting three consecutive fastest laps and fending off the charge. The greater damage to the Eclipse chase though was done via an error by the Xero Corvette boys. Richard Stanton had closed the gap to the Corvette’s third place to just a few tenths and both pitted together – both teams were running their drivers solo and with the two pitting together, we might have expected them to leave nose to tail too. They didn’t – Dave Beecroft later explaining that his signal to start the C5’s engine had been misinterpreted as the signal to leave the pit. Cole roared off, leaving Stanton stationary for a further 25 seconds or so. The Corvette emerged between the two Moslers, very bad news indeed for Phil Keen, who would soon find himself bottled up behind, the big yellow Chevrolet too rapid to pass on the straights but circulating sufficiently off the leader’s pace to allow Kershaw to pull away steadily - until Cole was called to book for a stop-go penalty. It would be enough to secure the race win for Cadena and it would also allow Stanton to claim third place. There were a pair of TAG Heuer Carrera watches on offer for the winner of the aggregate race. Eclipse’s task was clear then, get into the lead and head for the hills, to bite away at the 14 second advantage held by Cadena entry at the end of race 1. The Moslers would again start on the front row but this time, A1GP race day, they would have a huge, 46,000 crowd to entertain – and with blue skies over Brands Hatch it would be the perfect stage for Steve Hyde. Both Moslers got a good clean start, Whight ahead of a purposeful Hyde, before an early Safety Car was scrambled to allow recovery of a beached Ferrari. The Safety Car had no sooner returned to the pitlane than it was scrambled once again, a beached Porsche this time, together with a Ferrari with a blown engine elsewhere on the circuit. This time though the Safety Car had appeared just as the 15 minute mark was passed and that meant the pit stop window was open. 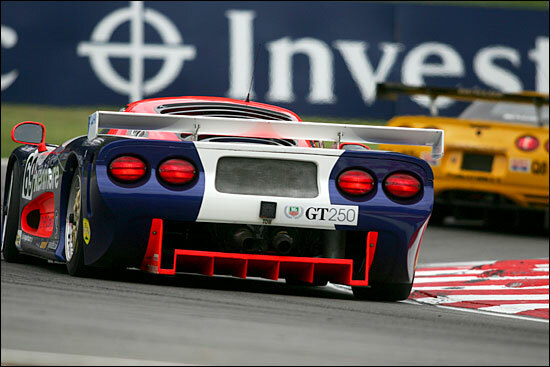 Bad news for Steve was that his track time had been punctuated by incidents with other cars – good news was that the Mosler pitted in good order, just inches behind their rival for the overall race win. With all bar five of the cars pitting immediately in line astern, it would be a very busy pitlane, the Mosler teams in particular keeping a watchful eye on each other. Sadly not a close enough watch! 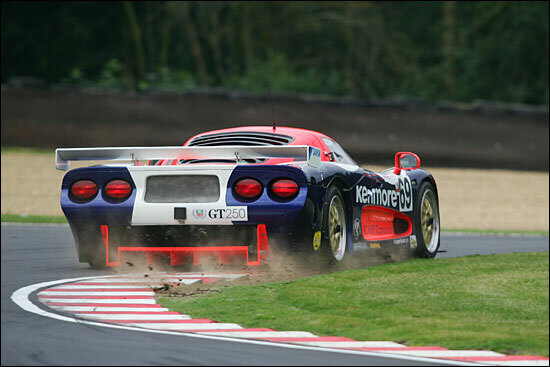 Gavan Kershaw left as Phil Keen started to pull away just ahead of him, something had to give – but sadly it didn’t, the cars made contact at the end of the pit lane and the Eclipse car was left with the front bodywork askew at the pitlane exit. The Eclipse pit crew sprinted down the pitlane to refit the dislodged panel, with the aid of some good old racetape, but thankfully the damage was no more than that – they build these Moslers tough! With the safety car still circulating, Phil Keen didn’t lose a lap, but his task was now a mammoth one, 23rd in the queue. The Audi pitted once again, but James Brodie, briefly at the head of the queue in the Monaro, saw Kershaw sweep by into the lead before Paddock Hill Bend. 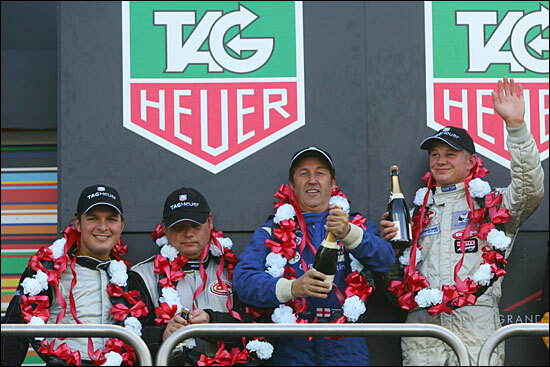 Phil Keen was looking to close the gap, fast, and was up to 12th after the first green flag lap, with a 26 second gap to the leader, the fastest lap of the race (a 1:29.0) would follow as he closed in rapidly on the Porsche battle ahead. Don't you love that diffuser? At almost the same moment, Simon Scuffham in the Team Scandal Elise was pictured on the TV screens exiting the Lotus on the run up to Druids, the car facing in the wrong direction and rear end looking the worse for wear. The third appearance of the Safety Car was almost inevitable. Phil Keen had already charged up to fourth, albeit still 21 seconds behind Kershaw - until the Safety Car reduced the gap to a handful of seconds. 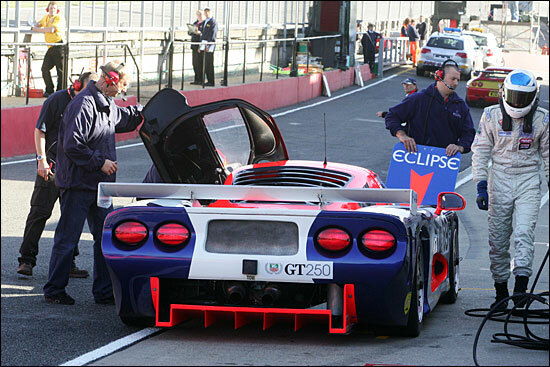 But as the Safety car was withdrawn, the lead car backed up the pack and in the confusion behind the Mosler there was contact between Phil Keen and the rear of Edwards’ #97 RPM Motorsport Porsche, the 911’s rear wheels lifted clear of the track by the impact and the resulting loss of control leaving Edwards spearing head on into the pit wall, with a sickening impact. Mercifully Guy Edwards’ young son was unhurt, but the car was severely damaged, stranded on the pit straight and needing a lift to remove it – cue the Safety Car for the fourth time. There was an angry exchange post race between a shaken Edwards and Richard Westbrook, the youngster feeling as if the accident had been caused by the #8 car (running a lap down), braking in front of him. Westbrook though was having none of it, replying that he could only follow the lead of the car ahead. The net result then was the Porsche out of the race and Keen continuing in second place, just a handful of seconds behind the lead car (but with 14 seconds of aggregate time to make up). On the penultimate lap the Eclipse car swept by the Cadena MT900R, Kershaw slowing dramatically before regaining speed – an intelligent tactic, no sense in risking losing the aggregate race with contact under pressure. 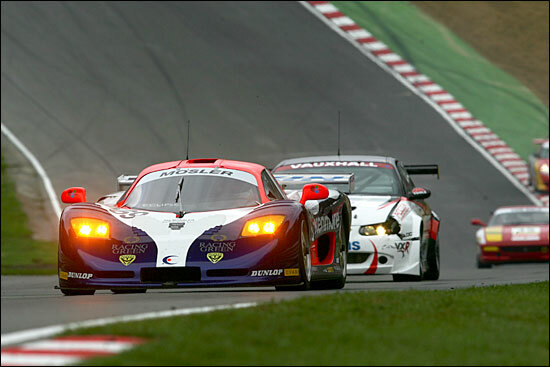 The #2 Mosler tucked in behind and followed on to finish the race a couple of seconds shy, 10 seconds clear on aggregate. So close but yet so far then for Eclipse but everyone had enjoyed the buzz of the big meeting, they’ll be looking for more of the same in 2006.